Mechanism of muscle decay on aging, and its reversal. Humans in their 70's and 80's experience a loss of skeletal muscle mass and strength (sarcopenia) that correlates with an increase in mortality in older populations. One reason this loss occurs is because the regenerative capacity of muscle stem cells (called satellite cells) declines with age as they switch from a quiescent state (from which they can emerge to generate new muscle progenitor cells) to a senescent-like state, which impairs the regeneration process, including activation, proliferation and self-renewal. Sousa-Victor et al. report, in experiments on aging mice, that this switch is caused by derepression of the gene encoding p16INK4a, a regulator of cellular senescence. They find that genetically silencing p16INK4a in geriatric satellite cells restores quiescence and muscle regenerative functions, suggesting a possible clinical strategy for rejuvenating satellite cells. I pass on this graphical summary of their results from the review by Li and Belmonte, followed by the abstract of their article. a. Satellite cells, a type of muscle stem cell, remain quiescent under normal conditions. After muscle damage, satellite cells become activated and re-enter the cell cycle to produce muscle progenitor cells that regenerate new muscle fibres. They also self-renew to replenish the stem-cell population. b, Sousa-Victor et al.3 report that during ageing, geriatric satellite cells lose their reversible quiescent state owing to derepression of the gene encoding p16INK4a, a regulator of cellular senescence. Instead, they adopt a senescent-like state (becoming pre-senescent cells), which impairs the regeneration process, including activation, proliferation and self-renewal. Regeneration of skeletal muscle depends on a population of adult stem cells (satellite cells) that remain quiescent throughout life. Satellite cell regenerative functions decline with ageing. Here we report that geriatric satellite cells are incapable of maintaining their normal quiescent state in muscle homeostatic conditions, and that this irreversibly affects their intrinsic regenerative and self-renewal capacities. In geriatric mice, resting satellite cells lose reversible quiescence by switching to an irreversible pre-senescence state, caused by derepression of p16INK4a (also called Cdkn2a). On injury, these cells fail to activate and expand, undergoing accelerated entry into a full senescence state (geroconversion), even in a youthful environment. p16INK4a silencing in geriatric satellite cells restores quiescence and muscle regenerative functions. Our results demonstrate that maintenance of quiescence in adult life depends on the active repression of senescence pathways. As p16INK4a is dysregulated in human geriatric satellite cells, these findings provide the basis for stem-cell rejuvenation in sarcopenic muscles. It is useful to occasionally be reminded of our essential strangeness, something I attempted in my "I-Illusion" web/lecture some years ago. Associate Scientific American editor Ferris Jabr engages this strangeness in his brief essay "Why nothing is truly alive". He notes the amazing life-like moving sculptures of Dutch artist Theo Jansen (see video), and points out how attempts to define life - as NASA has tried in defining the goal of what a search for extra-terrestrial life would look for - have floundered, the simple point being that while the concept of life sometimes has its pragmatic value for our particular human purposes, it does not reflect the reality of the universe outside the mind. Life is a concept, not a reality. To better understand this argument, it’s helpful to distinguish between mental models and pure concepts. Sometimes the brain creates a representation of a thing: light bounces off a pine tree and into our eyes; molecules waft from its needles and ping neurons in our nose; the brain instantly weaves together these sensations with our memories to create a mental model of that tree. Other times the brain develops a pure concept based on observations — a useful way of thinking about the world. Our idealized notion of “a tree” is a pure concept. There is no such thing as “a tree” in the world outside the mind...Likewise, “life” is an idea. We find it useful to think of some things as alive and others as inanimate, but this division exists only in our heads. Recognizing life as a concept is, in many ways, liberating. We do not need to recoil from our impulse to endow Mr. Jansen’s sculptures with “life” because they move on their own. The real reason Strandbeest enchant us is the same reason that any so-called “living thing” fascinates us: not because it is “alive,” but because it is so complex and, in its complexity, beautiful. Human memory is dynamic and flexible but is also susceptible to distortions arising from adaptive as well as pathological processes. Both accurate and false memory formation require executive control that is critically mediated by the left prefrontal cortex (PFC). Transcranial direct current stimulation (tDCS) enables noninvasive modulation of cortical activity and associated behavior. The present study reports that tDCS applied to the left dorsolateral PFC (dlPFC) shaped accuracy of episodic memory via polaritiy-specific modulation of false recognition. When applied during encoding of pictures, anodal tDCS increased whereas cathodal stimulation reduced the number of false alarms to lure pictures in subsequent recognition memory testing. These data suggest that the enhancement of excitability in the dlPFC by anodal tDCS can be associated with blurred detail memory. In contrast, activity-reducing cathodal tDCS apparently acted as a noise filter inhibiting the development of imprecise memory traces and reducing the false memory rate. Consistently, the largest effect was found in the most active condition (i.e., for stimuli cued to be remembered). This first evidence for a polarity-specific, activity-dependent effect of tDCS on false memory opens new vistas for the understanding and potential treatment of disturbed memory control. Security agencies are developing facial emotion profiling software for use at checkpoints, while Apple and Google are working on using your laptop camera to tell them what kind of mood you are in while shopping online. Such approaches are based on the assumption that a basic set of facial emotions are invariant across cultures and universally understood. A large body of work, starting with Charles Darwin and especially since the 1960's done by Paul Ekman and others has substantiated this idea. In yet another New York Times Op-Ed advertisement wanting to raise the visibility of some basic research, Barrett and collaborators make the heretical claim that this assumption is wrong and point to their articles questioning Ekman's original research protocol of asking individuals in cultures isolated from outside contact for many centuries to match photographs of faces with a preselected set of emotion words. They suspected that providing subjects with a preselected set of emotion words might inadvertently prime the subjects, in effect hinting at the answer, and thus skew the results. In one set of experiments subjects not given any clues and asked to freely describe the emotion on a face or state whether emotions of two faces were the same or different performed less well. When further steps were taken to prevent priming, performance fell further. A rejoinder from Paul Ekman and Dacher Keltner points out that a number of studies supporting Charles Darwin's original observations suggesting that facial movements are evolved behaviors have avoided the issues raised by Barrett et al. by simply measuring spontaneous facial expressions in different cultures, along with the physiological activity that differed when various universal facial expressions occurred. It seems reasonable that a universal facial emotional repertoire might in practice be skewed by culturally relative linguistic conventions, thus helping to explain Barrett et al's observations. Three studies examined Americans’ perceptions of incomes and income inequality using a variety of criterion measures. Contrary to recent findings indicating that Americans underestimate wealth inequality, we found that Americans not only overestimated the rise of income inequality over time, but also underestimated average incomes. Thus, economic conditions in America are more favorable than people seem to realize. Furthermore, ideological differences emerged in two of these studies, such that political liberals overestimated the rise of inequality more than political conservatives. Implications of these findings for public policy debates and ideological disagreements are discussed. The poor are universally stigmatized. The stigma of poverty includes being perceived as incompetent and feeling shunned and disrespected. It can lead to cognitive distancing, diminish cognitive performance, and cause the poor to forego beneficial programs. In the present research, we examined how self-affirmation can mitigate the stigma of poverty through randomized field experiments involving low-income individuals at an inner-city soup kitchen. Because of low literacy levels, we used an oral rather than written affirmation procedure, in which participants verbally described a personal experience that made them feel successful or proud. Compared with nonaffirmed participants, affirmed individuals exhibited better executive control, higher fluid intelligence, and a greater willingness to avail themselves of benefits programs. The effects were not driven by elevated positive mood, and the same intervention did not affect the performance of wealthy participants. The findings suggest that self-affirmation can improve the cognitive performance and decisions of the poor, and it may have important policy implications. A technique for enhancing error awareness in older age. Harty et al. note yet another salutary effect of transcranial direct current stimulation. A small voltage applied across the right dorsolateral prefrontal cortex enhances error awareness (by 10-12%) in older people. Their studies were done on 106 healthy oder adults 65-86 years of were recruited for four separate experiments. They used. ...a Go/No-go response inhibition task in which subjects are presented with a serial stream of single-color words, with congruency between the semantic meaning of the word and its font color manipulated across trials. Subjects were trained to respond with a single-speeded left mouse button press in situations where the meaning of the word and the font color in which it was presented were congruent (Go trial) and to withhold this response when either of two different scenarios arose: (1) when the word presented on the current trial was the same as that presented on the preceding trial (Repeat No-go trial), and (2) when the meaning of the word and its font color did not match (Stroop No-go trial). In the event of a commission error (failure to withhold to either of these No-go trials), subjects were trained to signal their “awareness” by making a speeded right mouse button press... Stimulation was delivered by a battery-driven DC Brain Stimulator Plus (NeuroConn), through a pair of 35 cm2 saline-soaked sponge electrodes. Current strength was 1 mA in all experiments. This produced current densities of 0.028 mA/cm2 at the skin surface of the scalp...In all four experiments, subjects underwent both Real and Sham tDCS in a single-blind, crossover manner. Default mode network: the seat of literary creativity? ...a distribution of correlated activity in the midline posterior cortex and bilateral posterior inferior parietal cortex. This forms the posterior part of the so-called default mode network (DMN; Figure 1), a system classically associated with the introspective mind. It has been observed before, in another meta-analysis of language studies, one that set out to reveal the semantic system [ref]. The authors of that review, and others since (ref), have discussed how memories, semantic and personal, emotions, theory of mind, and no doubt many other mental functions are linked through the DMN. This would suggest that overlapping components of the DMN are functionally interconnected with many separate brain systems, including those for language and semantics, and indeed this is turning out to be the case (refs). Spot the literary network: the default mode network (DMN) viewed from different angles (colors are intended for illustrative purposes only; data from [ref]). The medial posterior cingulate (PCC) and inferior posterior parietal components (IPP) were implicated in linguistic processing by Regev et al. [ref], but we suggest that due to the widespread connectivity of the DMN, these regions are related to higher order ‘literary’ processing. ...“the corporate consumption complex,” an alliance of corporations, banks, marketers and others that essentially promote and benefit from unhealthy lifestyles... it’s unlikely there’s a cabal that sits down and asks, “How can we kill more kids tomorrow?” But Freudenberg details how six industries — food and beverage, tobacco, alcohol, firearms, pharmaceutical and automotive — use pretty much the same playbook to defend the sales of health-threatening products. This playbook, largely developed by the tobacco industry, disregards human health and poses greater threats to our existence than any communicable disease you can name...All of these industries work hard to defend our “right” — to smoke, feed our children junk, carry handguns and so on — as matters of choice, freedom and responsibility. Their unified line is that anything that restricts those “rights” is un-American...Yet each industry, as it (mostly) legally can, designs products that are difficult to resist and sometimes addictive... The food industry has created combinations that most appeal to our brains’ instinctual and learned responses. Nick Bilton does a brief piece on how trying to win various kinds of video games enhances subsequent performance on real world attention and memory tests. Daphné Bavelier, a neuroscientist with the University of Rochester, found that people who play first-person shooter video games for two weeks can improve visual attention, mental reasoning and decision-making skills. A 2007 study by Iowa State University psychologists compared surgeons who played video games to those who didn’t and found that, during laparoscopic surgeries, the gamers were 27 percent faster and made 37 percent fewer mistakes than nongamers. And decades of research around Tetris has shown that playing it for extended periods may increase memory and cognitive skills. ....the goal is to figure out what makes a game addictive on a neurological level, then to couple this with brain research showing how play can improve the mind...imagine five years from now that you go to the doctor with a problem and he prescribes an F.D.A.-approved video game for you to download and play for two weeks. It is currently not known whether caffeine has an enhancing effect on long-term memory in humans. We used post-study caffeine administration to test its effect on memory consolidation using a behavioral discrimination task. Caffeine enhanced performance 24 h after administration according to an inverted U-shaped dose-response curve; this effect was specific to consolidation and not retrieval. We conclude that caffeine enhanced consolidation of long-term memories in humans. Figure: Effect of post-encoding caffeine on memory. On day 1, subjects viewed a series of images of everyday objects and made a judgment about whether each image was likely to be found indoors or outdoors. Immediately after completing this task, they took either caffeine or placebo. Measured caffeine levels fully returned to baseline by the next day. On day 2, subjects were given a surprise memory test. Subjects viewed a series of images and decided whether each image was new (not seen on day 1), old (identical to one of the images from day 1) or similar (a different exemplar of one of the images seen on day 1). The probability of correctly labeling similar images as similar (instead of old) was reflected by a lure discrimination index that corrected for potential response bias. 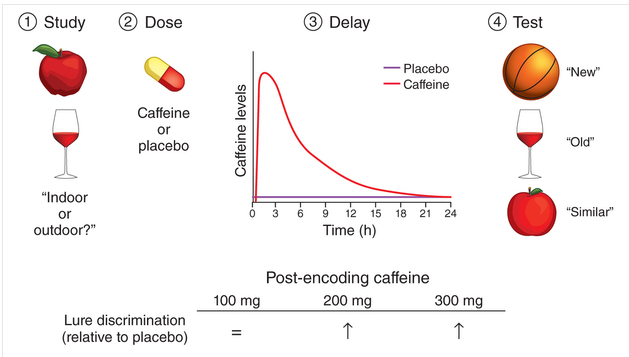 Subjects who received 200 or 300 mg of caffeine after the study period on day 1 showed enhanced lure discrimination on day 2 compared with subjects who received placebo. At 100 mg, caffeine did not enhance test performance, nor did caffeine administered just before the memory test (not shown).